Oh, the monkeys have no tails in Zamboanga. Oh, the carabao have no hair in Mindanao. Oh, the birdies have no feet in Mariveles. Oh, we'll all go up to China in the spring time. Oh, we'll all go down to Shanghai in the fall. Oh, we lived ten thousand years in old Chefoo. I heard people singing this song when I was growing up in Zamboanga and I thought to myself, why? Then years later when I moved to the USA (70's), to my astonishment I heard Lee Marvin (correction: John Wayne) sing this song in the movie "Donavan's Reef" where he co-starred with John Wayne. My father-in-law gave me the video movie. He was a John "Duke" Wayne buff. He was stationed in Zamboanga during World War II. I was just dating my wife then when he talked about this little trivia. Was this just clean fun? Jealousy perhaps because we can climb coconut trees and they can't? Who originated this song? It sounds a little bit like "Don't you go". Here are some comments from our web site's visitors: Do you have any comments? Click Here. NOTES: Your knowledge is only as good as your understanding and personal bias. Jim Moore is a professor of anthropology at the University of California at San Diego. 1. While we’re on the topic, it seems relevant to note that my father was born in Zamboanga (Philippines); apparently there was a popular song early this century about "Zamboanga, where the monkeys have no tails" (probably a taxonomically incorrect reference to orangutans). This gave my father his lifelong nickname: [the missing] Link. See what I mean, relevant? There’s this song entitled "Monkeys Have No Tails in Zamboanga" that US soldiers assigned in Zamboanga sang during World War II. Lee Marvin sang it in a John Wayne-starred ‘70s film entitled "Donovan’s Reef" set about the same period the song achieved notoriety among American troops in Southern Philippines. Surfing the net, I discovered that there are two books bearing the same title, one by Wolfe Reese, published in 1959 by Henry Regnery Company. The other one was published earlier in 1935, by a colonel, a certain S.P. Meek, who chronicled a US soldier’s wartime adventures in the Far East, obviously all the way to Zamboanga. "Oh, the monkeys have no tails in Zamboanga. They were bitten off by whales," goes the song, alluding to the natives who climbed up trees with simian skill to the amusement of American troops blushing in envy. Ron Shelton might as well shoot a sequel to "White Men Can’t Jump." But let’s leave it at that for now. You want to know how Western eyes saw us during those times, try to watch the 1936 film "Zamboanga," Pelikula at Lipunan’s main feature in its Cebu stopover Friday and Saturday at SM Cinema. Starring Fernando Poe Sr. and Rosa del Rosario (if, at all, the names ring a bell to you), the film was directed by Eduardo de Castro under American producers, Eddie Tat and George Harris in 1936. After its New York release during that year, the film retreated to obscurity after bureaucracy and taxes robbed its producers of profit. Mowelfund director Nick de Ocampo found the 67-year-old film, "one of the hundreds made before the war," at the US Library of Congress. Pelikula at Lipunan, organized by the National Commission for Culture and Arts and the Mowelfund Film Institute, is not only Zamboanga. It also features short films and documentaries by Filipino independent filmmakers. You only have to pay P20 for a movie. CAGAYAN DE ORO CITY — My generation was the last to have two National anthems to sing in flag-raising and lowering days (Mondays and Fridays) in school. The Cagayan Elementary School was then housed between the St. Augustine’s Cathedral and City Hall (formerly Police Department) near the bank of Carmen River. An oversized tarpaulin served as our roof on a lot formerly occupied by the US Army Corps of Engineers, appropriately called the "alteration shop." "Oh, the Monkeys Have No Tails in Far Zamboanga;" This was later changed to Don’t you go to Far Zamboanga" a ditty extolling the intoxicating beauty of its women. We were conditioned to ‘Think Poor:’My Nipa Hut Is Very Small; "I was poorly born on the top of the ma-hountin"; "Planting Rice Is Never Fun." A bright classmate, Celso Valmoria - now an Army Colonel, memorized the "I am Pepe. I am Pilar primer from cover to cover and recited it to show off. "A good Moro is a dead More" attributed to General Blackjack Pershing (who ordered the invention of the .45 caliber pistol to stop a rampaging, Kris-wielding juramentado in his tracks) also taught us the early prejudice. Ms. Maandig was a very kindly and patient teacher but a strict disciplinarian when demanded. Since the river was only a few steps away, we would sneak out of the classroom to take a dip, leaving our clothes behind the bushes. Upon coming back, we’d sit on the rocks to dry off. Carmen river was deep in our time and it became a rite of passage of boys who wanted to be ‘bigger’ in the eyes of others. You can now walk to the other side. For naughty students, Ms. Maandig would always pinch the smallest portion of our hita (non-Cebuanos will have to ask a friendly one for the exact meaning) or take our clothes to her room. The miscreants would hide in the bushes shivering since being nekkid was shameful and we had to beg a classmate to appeal to our head teacher for our clothes’ return.Despite fisticuffs, kneeling in mongo beans for atonement of sins, I had a fun time growing up and getting educated. On graduation, I received three awards: medals for Neatest Student, Most Improved and Most Behaved. This is a simple story of a boy, a ship, and a monkey, and the voyage they made to China in the mid-1920’s those brief golden years before depression and war turned the world upside down. Reporting aboard a ship to get away from his uncle, the boy finds himself lost in a lonely limbo half-way between the ship’s officers and the Chinese crew. His efforts to make things better lead him deeper and deeper into embarrassed isolation. Hardcover Fine Hardcover, Henry Regnery Co, Chicago, 1959. Possible 1st edition. Near Fine/Good+ dust jacket in Brodart cover. Page edges lightly bumped. NO marks, NOT clipped, jacket rubbed edgeworn with small chips missing along the edges. 8vo 8¼ x 5½ inches, 169 pages. Besides writing two excellent lost race novels set in Amazonia - Drums Of Tapajos and Troyana (Avalon , 1961; originally in 1930s pulps) - and the classic SF short stories "Submicroscopic" and "Awlo of Ulm" (in Before the Golden Age, Isaac Asimov, ed., Doubleday & Co., 1974), also wrote several humorous short stories. 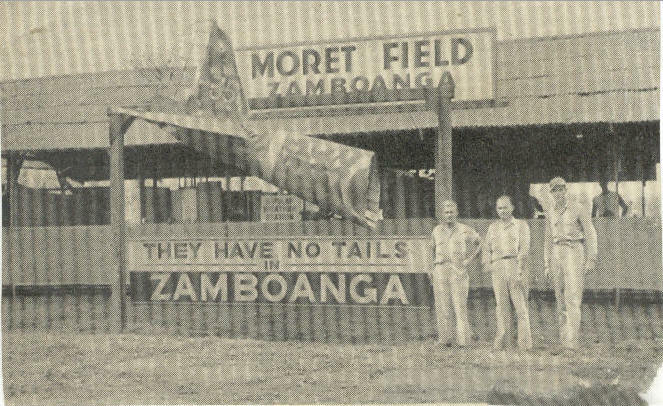 These freewheeling slapstick tall tales are set in a U.S. Army camp in the Philippines in the early 1930s, and collected in The Monkeys Have no Tails in Zamboanga (William Morrow & Co., 1935). The title story is based on a famous anthropological hoax of the early 20th century where isolated natives of the Philippine island of Zamboanga were photographed with monkey tails attached at the base of their spine and passed off as the missing link. One story includes a plant which bears peas and corn and secretes its own tin can around them, creating a pre-packaged-succotash plant. Ted, I know the poem you’re thinking of, and I can’t remember it either. We didn’t go ashore that day. We just unloaded and got out fast. If that day is any indication, the monkeys (Japanese) had their tails shot off in Zamboanga. I cannot believe that Kiplinger ever said this!! But maybe he did. Will stand corrected. But I grew up in a Navy town in California pre- WWII with reasonable parents. The point of "they have no tails in Zamboango" statement was undertood to mean that Phillipinos were monkeys without tails. No wonder society has problems. RETURN TO ZAMBOANGA... circa 1928! Before returning to Jolo, the MARINDUQUE was ordered to make some small surveys in the vicinity of Zamboanga. We spent three months there and the wives lived in the Plaza Hotel which was well run by a Filipino gentleman named Bayot. Mr. Bayot and his wife were very kind to them and they enjoyed the stay. As a fact which might be published in "Believe It or Not" there were only forty Americans living in Zamboanga and five or them including Marian celebrated their birthday on July 13. At the Club in Zamboanga there was often a large party. There was a retired Philippine Constabulary Colonel named Fletcher who was always the life of the parties. He would invariably perform the following stunt at the club parties. He would place three tables, each one slightly smaller than the previous one, one on top of the other. On the top table he would place four beer bottles. He would then climb up, place the four legs of a chair on the beer bottles and stand on the chair to lead the singing of, "There’s Many a Man Been Murdered in Luzon" and "The Monkeys Have No Tails in Zamboanga". He was said never to have fallen during this stunt regardless of how much he had been drinking. It was a remarkable performance. On Good Friday we saw the procession of the penitentos walking barefoot in sack cloth and scattering ashes on their heads. "By 1906 a volunteer band provided entertainment as well as martial music at formal events. One of the favorite songs was "The Monkeys Have No Tails in Zamboanga," which Olongapo-based Marines parodied by singing: "Oh, we won’t go back to Subic, Where they mix our wine with Tubig; Oh, we won’t go back to Subic anymore." (Tubig, in the dialect of Tagalog, means water, and the concoction summed up life in the Philippines for most Marines.)" 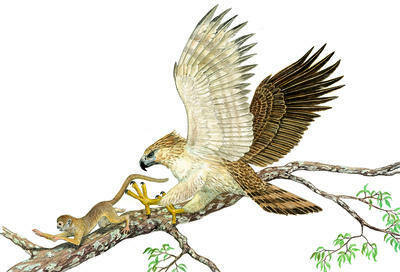 Voted as probably the best overall, and one of the largest raptor species in the world, the critically endangered Philippine Eagle is famously known as the Monkey-eating Eagle for visible reasons, with one obvious evidence being the lucky monkeys who missed being their full meals and baffling visitors to their island habitats as to why there are tailless monkeys in their midst? Can this Pithecophaga jefferyi be an indiscriminate predator to other local primates, and live long enough to sing about it? Will the Aguilas have any tails left? Where they reign supreme, before extinction. What's in a song? Here's a chronology of this particular Zamboanga ditty. What can you surmise? Captain Pratt, with about 185 men of the 23rd U. S. Infantry, arrived at Zamboanga to relieve the Spanish garrison troops of the Real Fuerza de Nuestra Señora del Pilar de Zaragosa as part of their Philippine purchase agreement with Spain. It is doubtful that the popular "The Monkeys Have No Tails in Zamboanga" ditty was composed within this century's short period of occupation. It was between this time period that the original "The Monkeys Have No Tails in Zamboanga" was composed. Who composed it? When? Where? Why? Any facts you can send us will be gratefully shared to others. 1906 This is the first time period where reference to "The Monkeys Have No Tails in Zamboanga" song is evidenced in writing from the story by R. R. Keene in Revisiting the Philippines: Subic Bay Marines Return to Their Old Barracks. "By 1906 a volunteer band provided entertainment as well as martial music at formal events. One of the favorite songs was "The Monkeys Have No Tails in Zamboanga," which Olongapo-based Marines parodied by singing: "Oh, we won’t go back to Subic, Where they mix our wine with Tubig; Oh, we won’t go back to Subic anymore." (Tubig, in the dialect of Tagalog, means water, and the concoction summed up life in the Philippines for most Marines.)" "EARTH MEASURER," the autobiography of Carl Ingman Aslakson, who served in the U.S. Coast and Geodetic Survey for thirty-two years, from 1923 until 1955. He began his survey work of the Philippines upon arrival in Manila on January 5, 1928, reporting onboard the ship called MARINDUQUE, landing in Zamboanga a few months later to the popular revelry of "The Monkeys Have No Tails in Zamboanga"
Captain S.P. Meek (1894-1972), author, wrote several humorous short stories, wherein "these freewheeling slapstick tall tales are set in a U.S. Army camp in the Philippines in the early 1930s," and collected in his book entitled "The Monkeys Have no Tails in Zamboanga" (William Morrow & Co., 1935). This is the first evidence that shows the context of the popular Zamboanga ditty was removed from a favorite sing-along to a parody come along short story that is said to be chuck full of slapstick. "The title story is based on a famous anthropological hoax of the early 20th century where isolated natives of the Philippine island of Zamboanga were photographed with monkey tails attached at the base of their spine and passed off as the missing link." Former Philippine dictator Marcos did a similar thing during his time in office, paying locals to get naked and act as members of a lost Filipino tribe during the day for his scientific amusement, and at night the locals would change back into their blue jeans and head to the closest drinking joint and tell their tall tales, making fun of gullible Western scientists and media. Who was kidding who? One good joke deserves another, right? Another author named Reese Wolfe, wrote a book with the same title as that of Captain Meek's, "The Monkeys Have no Tails in Zamboanga", depicting "a simple story of a boy, a ship, and a monkey, and the voyage they made to China in the mid-1920’s those brief golden years before depression and war turned the world upside down. Reporting aboard a ship to get away from his uncle, the boy finds himself lost in a lonely limbo half-way between the ship’s officers and the Chinese crew. His efforts to make things better lead him deeper and deeper into embarrassed isolation." I first heard this song sung by Beaver, in the 1960s show "Leave it to Beaver". Because he pronounces Zamboanga with an american dialect, I didn’t realize at first that the song was referring to the Phillipine province. But the song stuck in my head and after singing it to myself a few times, I realized what the word meant. So I did a goole search for children’s songs zamboanga and your site showed up. I had no idea the song implied that filipinos were monkeys. I find it hard to believe that any American school children who sung this song in years past had no idea what or where Zamboanga is and had no idea what the song was about. It appears the song was written around 1899-1901. I am American and I don’t remember ever hearing this song while I was a child. I am 43 now. It fascinated me when I realized that Beaver was singing a song about the Philippines so I researched it. I am married to a filipina (from Manila) which is the only reason I know what Zamboanga is. Comments: I think it's ridiculous that it seems you're proud of the existence of the song! There's even no question about it: Of course the song is an insult to the people of Zamboanga! It calls you monkeys with no tails! I am pretty sure that Zamboanga has many other things to be proud of than this racist song! Please remove it from your website as soon as possible! Could you please give me the words to "The Monkey's have no tails in Zamboanga"? I am a Navy newsletter editor ..my newsletter is The ChinaGunBoatMan... we write about the Far East and the former Asiatic Fleet whose ships visited Zamboanga. Comments: Actually, John Wayne sang it in Donovan's Reef. . .right before he tossed Miss Le Fleur out the window. Great site! Comments: I remember reading a book entitled "The Monkeys Have No Tails in Zamboanga," when I was about 12. It was a very old book in my dad's mini-library in our house in Baliwasan. It had a very profound effect on my young mind. That book might have contributed to that song. I recently browsed the net and found out there are two books with similar titles, although I think I read the one written by Capt. S.P. Meek, c.1935. I still remember some passages in the book. I think it related the adventures of a group of American soldiers in the Far East, from Zamboanga to the U.S. involvement in Siberia during the Russian Revolution. Some people, if they happen to read it, might be offended by the way the book was written (remember this was in the early 1900's). It said that if you cut a monkey's tail, it can pass for a Filipino. Also that our languages sound just like the monkey's chatter. The book also pictured and caricatured us in all the racist ugliness that were prevalent in those times. Anyway, I hope I was of help. Again, kudos to the good people of Zamboanga.com and Chavacano.org for their tireless efforts to showcase, preserve, and advance our culture and language. I want you to know that all your hard work are appreciated by Zamboangueños all over the world. There are more people who visit your sites than you can imagine. Viva ciudad de Zamboanga y era cerca ya llega la amistad y la paz. Comments: This is pretty spacey for me....... The first time I heard of Zamboanga was in the song, "the monkeys have no tails in Zamboanga" in the Donovans Reef movie with the Duke.... I never realized it existed, but here you guys are in the real world with a cool website. This world is really something. I am amazed everyday. I wish you all the best of luck, prosperity and health. If you should ever be in my area of the globe, look me up and say hello.